Nearest: Tube Station: Notting Hill Gate 70 yards (64 metres), Railway Station: Shepherds Bush 1 miles (1.6 km), Motorway: M4 Junction 1 3.8 miles (6.1 km). An amazing 4 underground stations within 0.5 miles (0.8 km) of the hotel. The Laslett Hotel is located just off from one of London's most fashionable shopping and residential areas, Notting Hill. On the north western edge of central London, much of its rise in popularity is in part thanks to the film of the same name that starred Julia Roberts. Unlike other major shopping areas this part of London has its own village type feel. Off from the high street (Notting Hill Gate) are some of the most desirable residences in London with pop stars, film stars and politicians all choosing to live in this area. At its west end is Ladbroke Grove where each summer the huge street festival known as the Notting Hill Carnival. To the south is another residential area, Holland Park, with a great park which incorporates an open air theatre. Also within walking is Kensington Gardens/Hyde Park while Kensington High Street is within half a mile. The busy antiques market of Portobello Road is 300 yards from the hotel. A major plus is the proximity to the nearest tube station which is just a few yards from the hotel. Converted from five former Victorian townhouses The Laslett Hotel is the creation of hotelier Tracy Lowy. The hotels boutique style and feel is inspired by the heritage, community feel and buzz of the locality, Notting Hill, as made famous in the Julia Roberts/ Hugh Grant film of the same name. Even the name Laslett is taken from Rhaune Laslett who organised the original Notting Hill Festival later to become the annual Notting Hill Carnival. An eclectic selection of artwork gives the Laslett its unique charm. The ground floor is described as a neighbourhood hangout and features a curated British library and walls of art, certainly not your traditional hotel lobby. All bedrooms come with high end British furnishings and works of art along with antiques from a local dealer, there are even a selection of penguin classic books. Penguin is the publisher not the genre! Guests benefit from free wireless internet, minibar (the hotel calls it their Big Bar and is filled with craft beers and treats), large flat screen TV with SKY digital channels, telephone, Neals Yard remedies, laptop sized safe and desk with USB charging point. Bathrooms come with subway tiles, hairdryer, free toiletries and have either a bath with shower or a walk-in shower. Some rooms have a day bed. Interconnecting rooms available as are handicap accessible rooms. All rooms are air-conditioned and have 24 hour room service. A breakfast tray with cereals, pastries and breads, yoghurt, coffee, tea and cold-pressed juice can be served in-room. Onsite is The Lasletts Library and shop. The library contains British art and design books, curated walls of art, and a concept shop showcasing designers and artists who have agreed collaboration with the hotel. There is lift access to the upper floors of The Laslett. Other services include 24 hour front desk, luggage storage, concierge service, lounge area, dry cleaning, wake-up service, newspapers, safety deposit box and ironing facilities. In-room spa treatments available and must be booked in advance. Public areas are wheelchair accessible. Ampersand Hotel: is 1.4 miles (2.2 km) away, has a guest satisfaction score of 90% and rates start from about £192. The Arch Hotel: is 1.6 miles (2.6 km) from here, earns a customer rating of 98% and base rates begin at about £212. Capital Hotel: 1.6 miles (2.7 km), rated at 89% and with rates from around £254. 11 Cadogan Gardens: 2.0 miles (3.2 km), rated at 89% and with rates from around £263. Milesfaster ranking: 223rd from 866 London hotels, 4th of 9 Small Luxury Hotels, and 89th of 131 five star rated hotels. Another to Consider: Another hotel that is much like the 10 Pembridge Gardens By Mondo and not too far (0.7 miles, 1.1 km) would be the 5 star Milestone Hotel and Apartments, where prices begin from around £332 and which has a 99% guest satisfaction rating. The Milestone Hotel and Apartments also offers: free WiFi. For a hotel that offers lower base rates take a look at the The Exhibitionist Hotel. 1.3 miles away (2.1 km), has been rated at 82% by past guests and whose lowest rates start at about £99. Would you prefer to go with something that has scored higher in guest satisfaction ratings? If that is what your after then the 5 Star Marriott Grand Residences Mayfair seems like a possible option being 1.8 miles (2.9 km) from the The Laslett. The Marriott Grand Residences Mayfair has a perfect unblemished customer rating 100%, a truly stunning achievement. 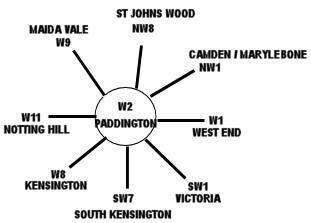 The fifty closest hotels from here (6-14 Pembridge Gardens, W2 postcode) that we have data for cover a 0.9 miles (1.4 km) radius. The 50 consist of 4 five star hotels (average rating 92%), 24 four star hotels (average rating 79%), 17 three star hotels (average rating 71%) and 5 two star hotels (average rating 68%). Of these hotels the highest rated is Milestone Hotel and Apartments (5 star) at 99%. Base Rates: See how the area stacks up for low rates using base rates. We use published base rates but note these do not reflect special offers or short term discounts so remain a rough guide. We have calculated the average base rate for all the 50 nearby hotels at £114 per night. The low end of the scale shows rates from £11 at Smart Hyde Park View Hostel (2 Star, 71%) to a high of £720 at Commodore Hotel (4 Star, 60%). Rate averages for each star rating: Five Star average: £225, Four Star average: £141, Three Star average: £71 and Two Star average: £36. We rank hotels based on their guest rating but balanced for their influencing factors. We rank The Laslett 3rd (joint) of 50 and 3rd (joint) for the 4 five star hotels in the area. For lowest base rates in the area this hotel ranks 44th of 50 (1st of 4 five star hotels.). Our ranking for this hotel based on both its rates and its user rating is 6th of 47 for pure value for money (Smart Hyde Park View Hostel was top). Almost uniquely in London The Laslett has evolved from a 3 star hotel as the Comfort Inn Notting Hill to a 4 star apartments as the 10 Pembridge Gardens and finally a 5 star hotel as The Laslett. This was the 10 Pembridge Gardens by Mondo untill August 2015 when it was marketed as 4 star serviced apartments. Was called the MiNC Notting Hill Suites till 2011. Was known as the Comfort Inn Notting Hill till 2008 (had 65 rooms). The 10 Pembridge Gardens then underwent major refurbishment, rebranding and an increase in its self rating from 3 stars to 4 stars.